While Jon Pechon is exhausted, Criminal characters get +2 skill. Flavor Text: Jon Pechon was methodical, detail oriented, a self-starter, and capable of developing and following complex strategies to achieve his goals. And working for O'Bannion, he even managed to turn his psychopathy to an advantage. This card is impressive. 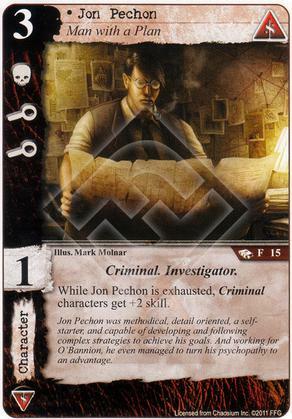 Since cards are exhausted when they are first committed to a story, this means that John Pechon himself (who is Criminal) always has a skill of 3 when committed, and that he terrifically enhances a whole mess of Syndicate cards. I guess there might be Criminals on the opposite side too, but other than that, it looks like you get a lot for what you pay here.